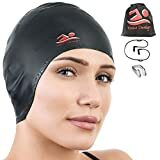 Yaavi Design gives you the best Professional Swim Cap if you truly want to enjoy indoor & outdoor swims while always keeping your hair dry & healthy! Designed with great attention to details and help from professional swimmers – It’s the most innovative way to increase your swimming performance and protect against chlorine! Why choose our Unisex Swimming Cap? Keep calm and Swim on ~ the 100% Waterproof Swim Cap stop the water from damaging your hair or ears during fast swims! Feel Better, Swim Faster ~ no one likes swimming with an uncomfortable cap therefore our ultra-elastic material which is soft & stretchable to perfectly fit your size! Health is our priority ~ made of 100% high-quality silicone, our caps are Odor-Free, Non-Toxic, Kid & Eco Friendly! 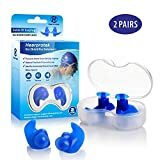 Approved by Professional Swimmers ~ the ergonomic ear pockets offer full protection, reduce overpressure and increase your speed in the water! Buy it now, Have it forever ~ it’s incredible useful even for wavy, curly & long hair and the strong seams insure extra durability! Yaavi Design was born to protect ~ our swim cap comes with 3 BONUSES: a nose clip, a pair of corded string ear plugs and a carrying bag for your dry stuff! Guaranteed – We guarantee your 100% satisfaction! If you are not satisfied, please contact us and we’ll replace it for free or refund your money! No questions asked! No hassle! Let’s start Swimming & Get to the Next Level! Add the Yaavi Design Swim Cap to cart and start your new journey!  MAKE EACH DAY YOUR MASTERPIECE! You want to enjoy swimming without the negative effects of chlorine on your LONG HAIR while we want to provide the perfect vehicle towards this goal. That’s why our WATERPROOF Swim Cap can STRETCH to 3X its size! 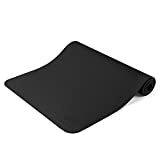 It does NO Tapply uncomfortable resistance on your head and completely prevents slipping out during laps.Professional Swimmers APPROVED it 100% of the time.- Achieve YOUR next level!  OUR MISSION IS A STRESS-FREE & ACTIVE LIFE – We believe in making everyday life easy and fun and that in helping you to do this in your own daily swims, we are creating happier people. 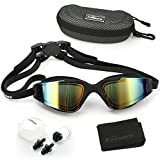 Yaavi’s ODOR-FREE Swim Caphas an ergonomic design offering maximum speed and full ear safety thanks to the Protective Pockets. Now, it’s time to STOP worrying about the water getting into your ears or the OVERPRESSURE. – Professionals never cut corners!  A PERFECT BIRTHDAY OR CHRISTMAS GIFT! If you are looking for a great gift for you or a loved one that has that “extra-cool and exciting” wow factor, then you will love our Yaavi Unisex Swim Cap. It’s created to fit both women & men while having a black stylish design. The cap comes with 1Nose Clip, 1 Sports Drawstring Bag AND 1 Pair of Corded String Ear Plugs. This bundle istruly the MOST FUNCTIONALgifts for any swimmer or water lover. – Kindness is Contagious! 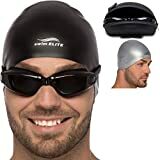  WHILE OTHER SWIM CAPS are too uncomfortable to wear, not waterproof “enough” to keep your hair dry or just simply rip apart after a few uses, our 100% Silicone Swimming Cap adjusts to your head shape and the unique design assures that NO WATER will get to your hair or ears. The highest-quality silicone also makes it stretchable when put on or taken off! This means LESS STRESS about damaging your hair during swimming and LESS MONEY SPENT on new caps every week.- We know your priorities! ❤️ ONLY THE BEST FOR YOU…We pride ourselves on providing top quality products and service for our amazing customers. We created our silicone swimming cap with extra care and attention-to-detail to provide the best Dry-Hair experience during swimming or showering. You can add your premium swim cap to your cart with total peace of mind, knowing that if you aren’t 110% happy with your purchase, we’ll provide you a FULL refund.